WinSnap is an enhanced utility for taking and editing screenshots that has more interesting features for the user. 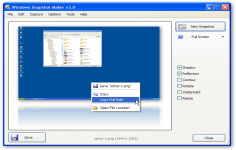 WinSnap is a user-friendly utility that will allow to easily edit and make screenshots. 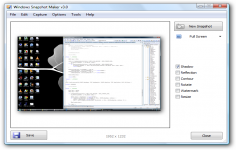 Both easy to use and rich in features, the software supports many formats and allows various manipulations of images such as adding shadow effects and color, transparency, implementation of catch with rounded edges, simultaneous capture multiple elements (windows, dialog boxes, buttons, etc.) and more. 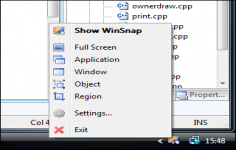 WinSnap allows to capture non-rectangular windows for example with rounded edges, capture multiple windows with multiple overlay, capture a region of a window. It also offers the possibility of watermarking photos with logo and automatic thumbnail creation.